Tag line: "You can't escape the most powerful force in the universe"
I didn’t care for Disney’s The Black Hole when I first saw it in the theater in 1979. Billed as the studio’s answer to Star Wars, I went in expecting intergalactic space battles, with good guys facing off against a powerful evil (much like... well … Star Wars). But it wasn’t that at all. In fact, for a 10-year-old, The Black Hole was kinda boring. Now that I’m older and a bit more patient, I wanted to give the film another chance. Is The Black Hole the dull, lifeless movie I remember, or did its message simply go over my head? While traveling through space, the Palomino and its crew, namely Capt. Dan Holland (Robert Forster), Lt. Charlie Pizer (Joseph Bottoms), Dr. Alex Durant (Anthony Perkins), the clairvoyant Dr. Kate McRae (Yvette Mimieux), journalist Harry Booth (Ernest Borgnine), and robot assistant V.I.N.C.E.N.T. (voiced by Roddy McDowall), stumble upon what appears to be an abandoned research vessel. As it turns out, it’s the USS Cygnus, a ship that’s been missing for the last 20 years. 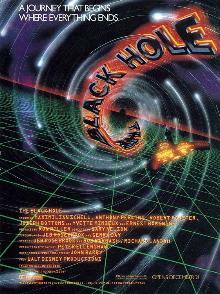 What’s more, there’s still somebody on board: scientist Hans Reinhardt (Maximillian Schell), who, with the help of his android crew and a mechanical guardian named Maximillian, is studying a nearby black hole. While on-board the Cygnus as Dr. Reinhardt’s guests, Capt. Holland and the others learn the truth: Reinhardt has become so obsessed with the black hole that he’s going to pilot his ship straight into it, all in the hope of discovering what lies on the other side. Dr. Durant believes his plan will succeed, but it isn’t until a robot named B.O.B. (voiced by Slim Pickens. Yes, Slim Pickens! ), which has been on the Cygnus for years, tells them about Reinhardt’s grand scheme that Capt. Holland and his crew realize they’re in terrible danger. In short, Reinhardt intends to take them into the black hole with him! Will the Palomino escape before it’s too late, or will the ship, and everyone inside, become part of what appears to be a suicide mission? One thing I learned from this recent viewing of The Black Hole is that, despite a PG rating, the movie isn’t really geared towards young kids. Well, not entirely, anyway; by its very design (a floating mini-bot with googly eyes), it’s obvious V.I.N.C.E.N.T. was created with the kiddies in mind, yet his steady stream of insights (his name is short for Vital Information Necessary CENTralized), as well as the telepathic bond he shares with Dr. McRae, bring more depth to this little bot than maybe even the filmmakers themselves intended. V.I.N.C.E.N.T. and fellow robot B.O.B. may look childish, but they’re two of the film’s most well-rounded characters. Add a healthy dose of scientific lingo (at one point, Reinhardt talks to Dr. Durant about an “Einstein-Rosen Bridge”), and you have a movie that has more in common with Star Trek than it does Star Wars. The effects are dated, of course, but this isn’t necessarily a bad thing (they fit the movie perfectly, and even gave it a bit of character). As for the cast, they do a superb job, starting with Maximillian Schell’s Reinhardt, who, despite his Captain Ahab-level obsession with the black hole, isn’t entirely unsympathetic (he’s a scientist hoping to prove a theory, and willing to do whatever it takes to see his experiment through). I also liked Anthony Perkins’ Dr. Durant, who is so fascinated with Reinhardt and his hypotheses that he actually considers tagging along on his adventure. As for the rest, Robert Forster makes for a heroic ship’s captain, and the always reliable Ernest Borgnine is at his slimy best as Harry, a guy who is never quite as trustworthy as he seems. With an intense storyline and an ending reminiscent of Stanley Kubrick’s 2001: A Space Odyssey, The Black Hole is a sometimes-thrilling sci-fi flick that will also give your brain a workout. I recently got around to watching this one as well. Definitely agree, it's more of a Star Trek type story. And that final sequence was impressive! I believe this film came out about the same time as Star Trek: The Motion Picture (another one appreciate more with each viewing).